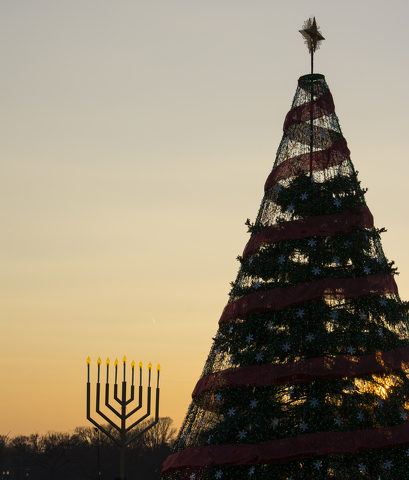 The National Menorah and National Christmas Tree in Washington D.C. Photo By Tim Evanson [CC BY-SA 2.0 (http://creativecommons.org/licenses/by-sa/2.0)], via Wikimedia Commons. It happened in August 1987. The sun, the moon and Earth’s Solar System siblings were aligned in an equilateral triangle, or grand trine, that was supposed to herald the dawn of an age of peace. According to Wikipedia, war, materialism, violence, abuses, injustice, oppression and real estate developers with spray-on tans and corn-silk comb-overs were going to cease by Dec. 21, 2012 – four years ago today. As you may have noticed, it didn’t happen, perhaps because we humans didn’t hold up our end of the bargain. One hundred and forty-four thousand of us were supposed to usher in the New Age by meditating at one of 36 power centers around the world. I was a day’s drive from one of them, California’s Mount Shasta, but I was too busy changing, washing and hanging my daughter’s diapers. If only I had known that exactly 143,999 sun dancers would show up! Well, this holiday season I have a chance to make up for my truancy back then. With Christmas Eve and the first night of Hanukkah colliding for the first time since Jimmy Carter lit the National Menorah, and six of our eight children (including partners and step-kids) journeying to State College and New York City from points north, west and northwest, we’re having a little harmonic convergence, a petite trine, if you will, of our own. Instead of meditating our way to love, peace and harmony, we intend to actualize these devoutly wished-for consummations by performing the following rituals: First, this afternoon, we will go to a local tree farm, select a Fraser fir the height of my fingers when I raise my arm over my head, and get one of the elves at the farm to lash it to the roof of my car so I won’t endanger the lives of trailing motorists on South Atherton Street by inexpertly tying it down myself. Then, we will wrestle said tree into the house, pop “Hipster’s Holiday” into the CD player and, while Santa does the mambo, hang the ornaments, slam down some hot chocolate and gobble up some Christmas cookies. We will conclude the festivities later tonight with the construction and demolition of hot fudge sundaes. These activities alone will not bring about the end of history, the cleansing of the Earth and the collapse of “false structures of separation.” For that we need to shift from Christmas observances to the rites of Hanukkah. What is required, specifically, is that we partake of fried potato patties and fermented potato potations while igniting wax cylinders and spinning tops inscribed with Hebrew letters. In other words, it requires a Lodka/Vatke Party. These devotions will calm the troubled spirits of my Jewish forebears, who have never gotten used to seeing me lie in the snow sawing at the trunk of an evergreen tree at a time of year when I should be grating the skin off my knuckles in pursuit of the perfect latke. Even after these observances the New Age cannot quite begin for we will have seen but four of the six children and so must cross Pennsy and Jersey to rendezvous with the other two in New York. There, weather permitting, we will greet the new year by walking, not running, the 5K course in Central Park along with the same magical contingent of 144,000 souls that were needed but did not quite materialize for “the globally synchronized meditation event” back in 1987. Unfortunately, this “point at which the counter-spin of history finally comes to a momentary halt, and the still imperceptible spin of post-history commences,” will not last beyond Jan. 20 – you know, Inauguration Day. At that point, as Harmonic Convergence spokesman Jose Arguelles foretold in 1987, “influences such as the arms race and insults to the environment” that could have caused “the breakup of the Earth into smaller bodies not unlike the Asteroid Belt,” will, alas, resume. This could have been averted “by harmonic convergence achieved in a synchronized collective of human beings, through which the possibility of a New Heaven and a New Earth is fully present” – in other words, if the electorate could agree on what a fact is. As things stand, though, with the Electoral College having ratified the results of the exercise in harmonic divergence that so many of us participated in on Nov. 8, we’re probably doomed. Happy holidays anyway. May you and yours conjure your own petite trine and enjoy a moment of bliss under your own roof, if not under the stars of heaven. 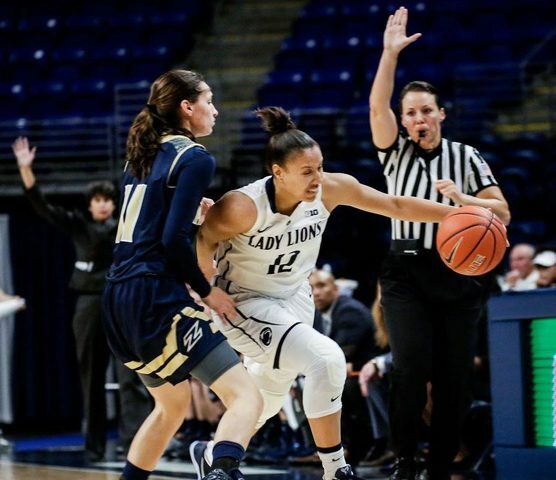 The Penn State women's basketball team (10-2) closed out non-conference play on Tuesday as it hosted Iona at the Bryce Jordan Center. The Gaels (6-5) hoped to keep momentum going and secure a fifth win in their last six games, but the Lady Lions used a strong offensive performance in the first half to grab the win, 80-67.